I'm in stage two of 'empty bin' mode - I got quite a lot of cards finished on the weekend, after meeting up with my friend who basically cleaned me out of all the cards I made during stage one (thank you, my dear friend!!). I focused on the rainbow of colours in the outlined flowers and used one of my old favourites, from Unity, along with a new favourite, the Inkadinkado sentiment. BTW, originally that wooden sentiment had "my way of saying" above the thanks. I popped the stamp into the microwave for 15 seconds, to loosen the glue and then just snipped off the extra words, knowing that I would get so much use from this simple, clean 'thanks'. You have such definitive style. I would have picked this beauty out of a line up as being yours. I love it. 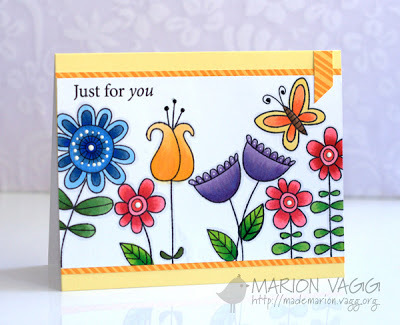 Love the gorgeous bold colors Ardyth! Fantastic card Ardyth, love t he bright coloured flowers! Fab, fab, fab! This is deceptively simple but the colouring and the composition is just brilliant. I learn so much from you every day Ardyth, thanks for sharing your talent. I totally knew this was yours when I saw the thumbnail without looking at the name! Very cute and colorful. Love! The bright colours are awesome Ardyth!! Brave lady....slicing and dicing up your stamps. 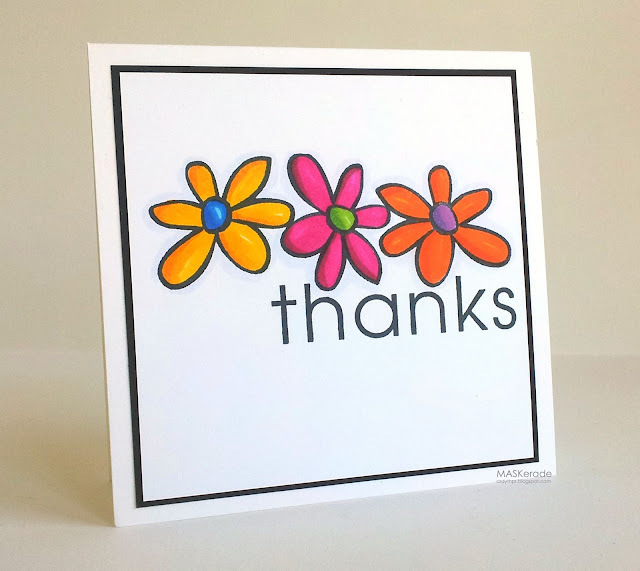 Great idea though - a simple "Thanks" stamp is so much more versatile. Ardyth, this is so pretty! So bright and so fun and so perfect for a sweet thank you! I'm continually in awe of how you take any challenge and "Ardyth-ize" it into something absolutely fabulous! Bright, bold, pretty - perfect 'thanks' indeed! Love this! The flowers are so bright and happy! Fabulous and bright, very Ardyth! This is STUNNING! Love those bright flowers! I love your card Ardyth! Such a lovely CAS card. Wowzer! You always have the neatest cards inspired by the Muse artist--something that never entered my mind. Love it!